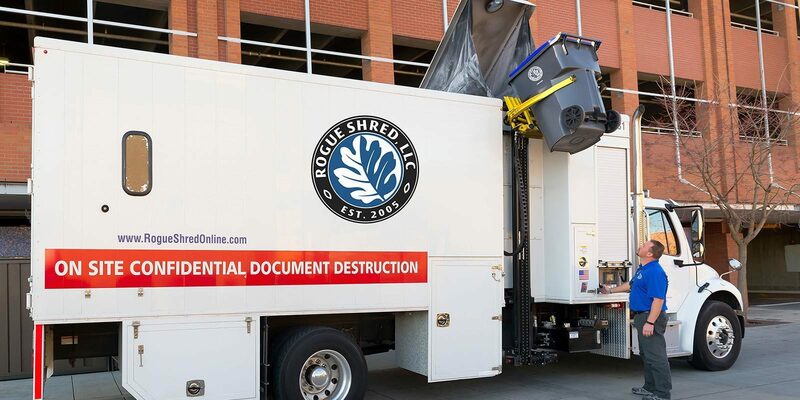 Whether you’re looking to get rid of years of old files and unnecessary paperwork or are interested in the immediate, secure disposal of confidential and sensitive materials, Rogue Shred can help. Our on-site document shredding service offers a cost-effective and confidential alternative to traditional office shredding and off-site shredding options. We provide the container – with various sizes available – so all you do is provide the material to be shredded. It’s that easy. Rogue Shred services are in compliance with the records privacy requirements mandated by the 1996 Health Insurance Portability and Accountability Act (HIPAA). And we can supply you with a Certificate of Destruction, providing a record that the documents you had shredded were securely destroyed. For more information on HIPAA visit the Department of Health and Human Services. Rogue Shred can also destroy your electronic waste. These items must be kept separate from paper waste. And please note that they fall under a different pricing structure. Depending on your needs and volume of materials to shred, we can pick up your documents on a weekly, monthly or on-call basis — including same-day service. The industry experts at Rogue Shred can help develop and implement a document destruction policy for your business — including staff training.